The recent introduction of several transposable elements in zebrafish opens new frontiers for genetic manipulation in this important vertebrate model. This review discusses transposable elements as mutagenesis tools for fish functional genomics. We review various mutagenesis strategies that were previously applied in other genetic models, such as Drosophila, Arabidopsis, and mouse, that may be beneficial if applied in fish. We also discuss the forthcoming challenges of high-throughput functional genomics in fish. Zebrafish exhibits many qualities that are essential in a good genetic model: relatively small size for vertebrates, high fecundity, reasonably short generation time, low maintenance costs, amenability to large-scale saturating mutagenesis screening, availability of mutants, genetic maps, and a sequenced genome. However, the lack of some classical tools in genome manipulation has been a serious drawback. In recent years, several transposable elements from heterologous hosts (Tc3, mariner, Tol2, Sleeping Beauty, Frog Prince, and Ac/Ds) have been successfully applied in zebrafish [1–6]. All of these 'cut-and-paste' transposon vectors are designed to operate as two component systems: a non-autonomous element that inserts into the genome of the host and a transposase that catalyzes transposition of the non-autonomous element. A non-autonomous element can carry a cargo inserted between the two end sequences that are required in cis for transposition. It is immobile in the absence of its transposase. The transposase is usually supplied in the form of mRNA by microinjection into fertilized eggs to induce transposition of the non-autonomous element. The ease of microinjection in fish is advantageous; the injected transposase mRNA is degraded some hours after injection, and new insertions of the non-autonomous element in the genome remain immobilized. The choice of many transposon vectors provides zebrafish biologists with a plethora of possibilities, but it also raises the issue of which to use and when. The Tc3 element from Caenorrhabditis elegans and the mariner (Mos1) element from Drosophila mauritiana were the first transposon vectors used to generate transgenic fish (Table 1) [1, 2]. However, since the initial reports, no further developments using these transposons have been described in the literature. Two transposable elements of fish origin, Tol2 from medaka (a member of the hAT [hobo/Ac/Tam3] superfamily) and Sleeping Beauty (a synthetic member of the Tc1/mariner superfamily), have both become widely used in the past few years (Table 1) [7–12]. Recently, a transposable system from plants has been added to this arsenal. The modified maize Ac/Ds elements are effective transformation vectors and produce high genomic Ds transposition and re-transposition rates in zebrafish (Table 1) . aThe combined size of 5' and 3' cis sequences of the element. bThe size of the nontransposon DNA fragment confined between the 5' and 3' cis sequences (excluding the letter). cAll transposon-mediated transgenesis data were produced in an essentially similar experimental setup. In each case the transposon DNA and the transposase RNA were co-injected into fertilized zebrafish eggs. The founders were outcrossed to the wild-type fish. Germline transgenesis was calculated as the percentage of founders that produced green fluorescent protein (GFP)-positive offspring among the total number of founders screened (shown in brackets). Except for a few cases, only the offspring expressing the GFP reporter was counted. 'PCR' indicates that no reporter gene was used; transgenic offspring was identified using polymerase chain reaction (PCR). 'GFP+PCR' indicates that the number included those expressing GFP reporter and those that were PCR-positive but did not express detectable amounts of GFP reporter. dIn these reports the transposase RNA was injected into fertilized eggs of a transgenic fish carrying a single transposon insert in its genome. The genomic re-transposition rates were calculated as the number of founders that produced offspring with novel enhancer trap patterns distinct from the pattern of the founder. Thus, the rates were underestimated. kb, kilobase. From the available reports, it appears that Sleeping Beauty produces lower transgenesis rates and is more sensitive to size of cargo fragments  compared with Tol2 and Ac/Ds (Table 1). Nevertheless, it should be possible to transfer large transgenes using a modified strategy . The Tol2 and Ac/Ds systems produce the highest transgenesis rates reported to date, and they are capable of carrying large cargo fragments without significant reduction in activity [6, 11, 15]. Both systems can generate multiple insertions that are advantageous for insertional mutagenesis. On the other hand, working with multiple insertion lines and maintaining them can be cumbersome. Furthermore, highly active transposons can undergo multiple excision-insertion events, leaving behind the untagged footprints and genomic rearrangements. It is surprising that despite a huge phylogenetic distance between hosts, the Ac/Ds system performs as well in zebrafish as in plants [6, 16, 17]. Moreover, transposition activity of Ac/Ds in fish is comparable to that of the fish-derived member of the hAT superfamily Tol2 (Table 1). The latter system has successfully been tested in several distant vertebrate hosts [3, 15, 18]. The Ac/Ds system has been utilized in many plant species, yeast , and now in vertebrates, which is the widest host range demonstrated for any transposon. These facts strongly suggest that members of the hAT superfamily are probably the most versatile cut-and-paste transposons, and can be broadly utilized in genetic manipulation of various organisms. This makes hAT elements the best candidates for introduction into new species that do not yet have established transgenesis and insertional mutagenesis techniques. The availability of alternative transposon systems is beneficial for various reasons. Different insertion preferences produced by different transposable elements can allow better distribution of insertions throughout the genome . The absence of cross-activation between different transposons permits independent sequential use of several elements within the same animal and can be useful for various applications. For example, one can envision using one transposon to generate transgenic reporter lines for any given cell type of interest, and these lines can subsequently be mutagenized using a different transposon to create a bank of mutations affecting that particular cell type. The simplicity and the ease of use, and the ability to carry complex cargo fragments, combined with high cargo capacity, makes transposons superior to retroviral vectors for fish transgenesis. Thus, generating transgenic fish using transposable elements is becoming a routine laboratory technique. Vertebrate genes contain disproportionately large introns compared with exons. Therefore, most random insertions would not directly disrupt coding sequences. In some cases such insertions can be mutagenic by affecting the regulatory sequences, causing mis-expression, or they may result in aberrant splicing or premature termination of transcription. However, such events often cause hypomorphic mutations, and the null alleles are assumed to occur rarely. Several approaches have been proposed to select for insertions within genes and to enhance the chances of disrupting gene function. A classic gene trap vector (sometimes referred to as 5' gene trap) harbors a splice acceptor site upstream of a promoterless reporter . When inserted into an intron of a transcribed gene it can cause abnormal fusion transcripts and expression of the reporter gene under regulation of the promoter of the gene into which it is inserted. Because gene trap vectors target introns, they are effective in species with large introns such as vertebrates. However, the rate of alternative splicing through the splice acceptor sequence of the gene trap cassette can be insufficient to prevent fully the synthesis of the original transcript, resulting in generation of hypomorphic alleles  or no detectable effect on gene function. Multiple splice acceptor sequences and multiple transcription terminator sequences  can be introduced into gene trap vectors to improve their mutagenicity and tagging efficiency. Another drawback of 5' gene trap is that only insertions in transcriptionally active genes are selected. Genes that are expressed at low levels or are not expressed during the stages observed in the screen remain undetected even if a tagged gene is successfully inactivated by the gene trap. To circumvent this, polyA trap vectors have been designed to tag genes regardless of their transcription status . A basic polyA trap vector (sometimes termed 3' gene trap) generally harbors a promoter driving the transcription of a reporter gene, which has no polyA signal but a downstream 3' splice donor sequence. Such reporters normally produce unstable transcripts, which after successful splicing are polyadenylated using polyA signals of the tagged gene. A promising modular mutagenesis approach has been recently developed in zebrafish . This strategy combines the mutagenic capacity of 5' gene trap with the high trapping capacity of polyA trap vectors. The 'gene-breaking' transposon vector developed by Sivasubbu and coworkers  harbors a 5' mutagenicity cassette and a 3' polyA trap cassette in the same transposon vector. The 5' mutagenicity cassette produces strong termination of transcription by combining an effective splice acceptor sequence with a polyA signal of ocean pout antifreeze protein. To date, only a few examples of successful gene inactivation using gene trap vectors have been reported in zebrafish [7, 10, 25]. Unbiased systematic studies using a statistically significant number of tagging events are required to estimate the actual mutagenic ability of the various gene trap designs and to compare it with the mutagenicity of transposon insertions carrying simple reporters or enhancer traps. Transposon vectors can also be designed to screen for gain-of-function mutations by random activation and/or over-expression of genes [26, 27]. In these screens, usually referred to as 'activation tagging' or 'modular mis-expression', transposons are equipped with enhancer or promoter sequences that can induce transcription of the endogenous gene adjacent to the insert. Several laboratories have begun testing these tools in zebrafish, but there are no published reports yet. If a transposon insertion residing inside an intron is found to be nonmutagenic, then such a transposon can potentially be re-mobilized in order to produce more insertions in the same gene or to generate flanking deletions. Various transposons preferentially re-transpose to nearby chromosomal sites (for example Ac/Ds in plants , P-element in Drosophila , and Sleeping Beauty in mouse ). Several elegant approaches utilize this ability of transposons to inactivate closely linked genes (Figure 1). Strategies for mutagenesis of nearby genes by re-mobilization of genomic transposon inserts. (a) Regional mutagenesis using gene trap elements (for simplicity, only a 5' gene trap is illustrated). Here, the reporter gene at the donor site is silent. Transpositions can be detected when reporter gene expression is activated. (b) Regional mutagenesis from a 'launch pad'. A 'jumper' element carrying a selection marker 'A' (for example, green fluorescent protein under regulation of a constitutive promoter) is inserted between an open reading frame of a marker gene 'B' (for example, red fluorescent protein) and a suitable promoter. When the jumper element is excised, the expression of the 'B' is switched on. Animals carrying an empty donor site and retaining the jumper element can be analyzed by polymerase chain reaction (not shown). (c) Regional mutagenesis from a launch pad combined with site-specific recombination system (Cre/lox in this case). The system is a modification of the method shown in part b but the carrier and jumper elements both carry loxP sites. After local re-transposition of the jumper element the region between the loxP sites is deleted or inverted according to the orientation of loxP sites using Cre recombinase. (d) Selecting flanking deletions using flanking marker recombination (from the method of P induced male recombination in Drosophila; see text for references). This approach requires two closely linked markers (A and B) around the donor site. The transposon is usually retained at one side of the deletion. (e) Generating deletions by selecting for 'imprecise excision' events. (f) A compound element optimized for screening of flanking deletions. This approach can detect the same events as the methods shown in parts c and d but no additional markers are required. The animals that harbor deletion events can be identified by loss of one flanking marker, whereas retention of the other marker shows presence of the donor site. Because not all offspring from a founder will harbor re-transpositions, it is beneficial to have a selection scheme for the transposition events. One simple approach is to use a genomic insertion of a gene trap transposon as a donor, and select for gene trap events (Figure 1a). A similar selection principle was successfully utilized in the mouse using the Sleeping Beauty (SB) transposon by Keng and coworkers . They used two unique donor sites containing multiple concatemeric copies of the SB element, a feature that ensured high re-transposition rates. The reporter gene carried by the SB element in these donor sites was silenced, and its expression was activated when re-transpositions caused gene trap events. The authors demonstrated high efficiency of this approach for region-specific saturation mutagenesis, producing insertions in all genes within a 4 megabase region surrounding the donor site. The selection scheme shown in Figure 1a can only detect transposition events that cause detectable reporter gene expression. A more effective strategy for selecting re-transposition events uses a combination of two selection markers: one to detect the excision events and another to retain the re-transposed element (Figure 1b). This double selection scheme utilizes two types of transposable elements. A 'carrier' element harbors a 'jumper' element and an excision marker. The 'carrier' is used to generate insertions in the genome that are subsequently used as the donor sites for transposition of the 'jumper' element. In plant genetics, such donor sites, usually called 'launch pads', have successfully been used to saturate specific regions of the genome with insertions [16, 31, 32]. Because zebrafish exons are small, the mutagenesis efficiency of this approach is expected to be low. Arming the jumper element with an additional 'mutagenicity cassette'  should be beneficial. 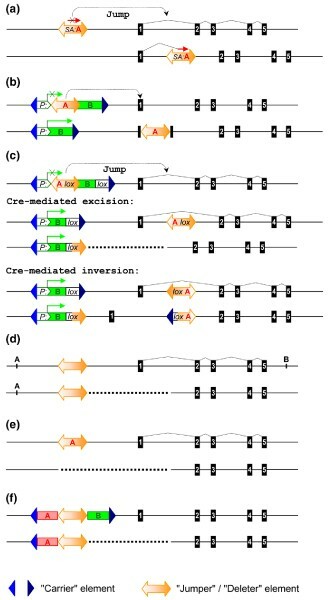 Another possible approach combines the local re-transposition from a 'launch pad' with a site-specific recombination system such as Cre/lox or FLP/FRT (flipase recombination enzyme/flipase recognition target) in order to produce flanking deletions or inversions (Figure 1c). In this method, the carrier and the jumper elements both harbor loxP sites. After the local re-transposition of the jumper element, a fragment between the loxP sites is deleted or reversed according to the relative orientation of the loxP sites. In plants this approach was demonstrated using a combination of the Cre/lox system, T-DNA as the carrier, and Ds element as the jumper [33–35]. In zebrafish, there are at least three heterologous transposon systems that can be used in various combinations with each other. Tol2 and Ac/Ds can both be used as carrier elements because of their large insert capacity. Upon mobilization, a transposable element can generate deletions, inversions, and other rearrangements around the donor site. When two insertions of the same transposon are found at different sites on the same chromosome, deletions and inversions of the region between the two insertions can be recovered [36, 37]. Two trans-heterozygous insertions (located at different positions on homologous chromosomes) have also been used to generate deletions in Drosophila . P-element insertions are frequently used as starting-points to generate flanking deletions in Drosophila by screening for male recombination events [39–41] or 'imprecise excision' events [42, 43]. The former strategy (Figure 1d) generally relies on the lack of male meiotic recombination in Drosophila . In this approach, recombination between two flanking markers in the male germline occurs only when the P-element undergoes a transposition process called 'hybrid element insertion', which causes frequent deletions . In zebrafish, meiotic recombination in males is also suppressed relative to that of female meiosis, especially near centromeres , but the rate of suppression is unlikely to be sufficient for effective application of this strategy. This approach can potentially be applicable using a pair of closely linked flanking markers. However, it is not known whether similar recombination events occur in fish and what is the frequency of long deletions. When a transposable element is excised, the double-strand break generated during the excision is sometimes repaired imprecisely, generating flanking deletions or other rearrangements. This has been often utilized in Drosophila [42, 43, 46] (Figure 1e). Although, the actual mechanism of 'imprecise excision' is unclear, it should be distinguished from the 'hybrid element insertion', which leaves the transposon at the deletion site (Figure 1d). Because large deletions (several kilobases) are expected to occur at low rates, this strategy may be feasible only when the insert is found very close to an exon of the target gene or when there is a convenient selection marker, which can be used to detect deletion events. An improved approach shown in Figure 1f eliminates the need for closely linked markers . A compound element consists of a carrier element that harbors a 'deleter' element inside, flanked by a pair of visual markers (for instance, green fluorescent protein [GFP] and red fluorescent protein [RFP]). During primary screening, the genomic insertions of the compound element are produced using the transposase for the carrier element. If the insert is found close to the gene of interest or if it lands in an intron causing no effect on gene function or hypomorphic mutation, then such insertion can be used as a starting point to produce flanking deletions by activating the deleter element. In this scheme, there is no need for additional genetic markers; deletions on either side of the original insertion can easily be identified by the absence of one of the flanking markers, whereas the other marker shows the presence of the donor site. A similar selection scheme with a single flanking marker was utilized in plants using the Ds transposon as a deleter . The strategies for generating flanking deletions illustrated in Figure 1c,f both have advantages and disadvantages. The strategy shown in Figure 1c requires two steps (re-mobilization and excision) to produce deletions, whereas the simpler strategy shown in Figure 1f needs only one step, thereby reducing the experimental time for at least one generation. On the other hand, the strategy shown in Figure 1c provides a platform for inducible and tissue/cell-specific gene inactivation. Until now there have been no reliable data published on the distribution preference of transposable elements in fish. Therefore, to evaluate the feasibility of the approaches described above, it is important to determine the level of preference to insert to linked positions and to determine the frequency and extent of the flanking deletions. Saturating the genome with random insertions (obtaining at least one effective hit in every gene) requires generation of a very large number of insertions, significantly larger than the total number of genes in the genome. It is problematic to generate, analyze, maintain, and maximize use of such huge collections. In the classical mutagenesis screens, this problem is addressed in two steps: animals are heavily mutagenized with highly active mutagens such as ENU (N-ethyl-N-nitrosourea) or retroviruses, so that every founder carries multiple mutations; and such collections are screened for the visible phenotypes, and only the mutant strains are retained and analyzed [49–51]. The main disadvantage of the phenotype-based mutant screening (forward genetics) is that only a relatively small number of genes are targeted, and mutations that do not cause obvious phenotypes are ignored or discarded. In the post-genome era, the most common problem is gaining insight into the function of genes that have been identified by sequencing but for which mutant information is lacking (reverse genetics). Therefore, reverse genetics approaches to mutant screening must operate with a complete collection of random mutations representing all genes, regardless of the phenotypic manifestation. Until recently, only one reverse genetic approach has been implemented in zebrafish to obtain mutations in the gene of interest. This approach utilizes TILLING (targeting induced local lesions in genomes) and re-sequencing of ENU-mutagenized fish for target-selected screening of point mutations in the gene of interest . Although this approach is very powerful, considerable screening efforts are required each time to obtain mutations in every new gene. Furthermore, this method of mutagenesis generates predominantly missense mutations, which may or may not result in phenotypes. An alternative approach to reverse genetic mutagenesis screening was recently pioneered by Znomics, Inc. (Portland, OR, USA), who have produced a large-scale library of retroviral insertions in zebrafish . The company has been identifying the locations of retroviral insertions from cryopreserved sperm samples containing, on average, 25 insertions per sample by sequencing the flanking DNA adjacent to the insertions. With 100,000 insertions already identified, Znomics hopes to map a total of half a million insertions. Thus, their bank of retroviral insertions promises to be a valuable resource for the zebrafish research community. However, the actual efficiency of the Znomics screen and the utility of the strains remain to be determined. Despite the recent vector improvements, the frequency of transposon insertions still remains lower than that of retroviral insertions (Table 1). It is therefore important to determine whether transposon vectors have the potential to complement the retroviral projects in the field of large-scale insertional mutagenesis. One way to increase the number of transposon insertions per germline is to use the donor lines carrying multiple inserts for re-transposition . The distribution of retroviral insertions (or any other known insertional mutagen) is not absolutely random . Thus, a single insertional mutagen (retrovirus) would be inefficient in hitting genes at 'cold spots', but instead it will produce in vast excess insertions in 'hot spots' when trying to achieve genome-wide saturation. The presence of hot and cold spots narrows the limits for efficient use of a single insertional mutagen in saturation mutagenesis screens. In order to achieve saturation more productively, it is worthwhile to launch several parallel screens of smaller scale using different insertional mutagens, rather than using a single agent alone . In this respect, having an arsenal of several transposable elements is an advantage. Because vertebrate genomes contain only a small proportion of coding sequences, the majority of retroviral insertions (or other random insertions) are found either in the intergenic regions or inside introns. In case of retroviral mutagenesis, the only way to increase the number of exon hits is by significantly increasing the number of insertions. Unlike retroviral insertions, transposons can be re-mobilized in order to obtain exon insertions or to generate flanking deletions (Figure 1). Re-transposition also offers a unique approach to reducing the size of insertion libraries - the 'launch pad' strategy [16, 32]. A relatively small collection of the launch pads (Figure 1) regularly distributed throughout the genome must be generated and deposited in a stock center. Then, even a moderate sized laboratory should be able to use a launch pad that is closest to their gene of interest for region-specific saturation mutagenesis to generate insertions in the target gene [30, 31]. Although thousands of transgenic fish lines can be created, stored, and recorded in a database in individual laboratories, the long-term maintenance of such collections and wide public distribution of the materials by the same laboratories appear problematic. Because large-scale projects in the field of functional genomics promise vast resources for the scientific community, the necessary funding can usually be obtained. In contrast, it is difficult to raise the additional funds necessary to further maintain and distribute the transgenic lines, and therefore the produced materials and data often remain largely unutilized and eventually wasted. Other sensitive issues such as authorship, sharing of intellectual property rights, and oppressive material transfer agreements, among other factors, are common and can significantly hinder progress . Operating on a cost-recovery basis may present a solution, but recovery from the cryopreserved stocks, quality control measures such as prevention of material loss, and insert confirmation can significantly increase running costs. Recently, a private company (Znomics, Inc.) produced a large collection of retroviral insertion strains, which are available for purchase on a per strain basis . However, it is early to speculate whether demand for the transgenic zebrafish lines will be large enough to extend this model to projects of smaller scale. The distribution problem is unlikely to be resolved without a dedicated stock center that can take on these responsibilities. The success of large-scale functional genomics projects in other model organisms was achieved largely because of centralization. For example, Arabidopsis stock centers maintain hundreds of thousands of genotypes produced by insertional mutagenesis projects [57–60], and large-scale collections of transposon insertions in Drosophila were also made available through stock centers . The existing zebrafish stock center  will need to scale-up its capacity in order to accommodate many thousands of new samples that might be generated very soon by several laboratories. At the present time, there appears to be some variability from laboratory to laboratory in cataloging transposon lines. Because various transposon screens are designed for different purposes (mutagenesis, enhancer and gene trapping, driver lines, and so on), it is important to develop a set of standard requirements for the lines that are deposited at the stock center. These requirements should define the alternative descriptions to be provided with each line that would allow a searchable database to be established. At the same time, these requirements should not deter the community from depositing their collections into the stock center. Arguably the simplest way to characterize an insertion line is by sequencing DNA flanking the insertions. This information can be used to map the insertions along the identified genome sequence (Znomics model). Alternatively, flanking sequences can be used to build-up the BLAST dataset, which would allow checking for the availability of insertions inside any DNA fragment using the BLAST search program. It is much more difficult to produce comprehensive expression pattern information, and to systematize and organize this information into a searchable database. High-throughput reverse genetics screening using transposable elements can generate a huge resource for zebrafish research, but the actual benefit of large-scale projects will depend on the subsequent utilization of this resource. This challenge will require coordinated efforts from the whole community. We are grateful to Karuna Sampath for reading and commenting on manuscript. We thank Temasek Life Sciences Laboratory for supporting our research.